When water is at a premium, you cut corners where you can. 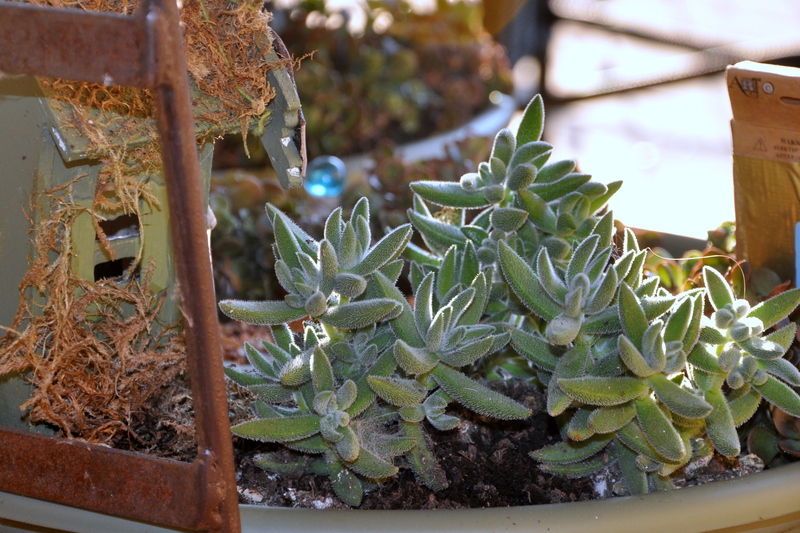 I’ve emptied most of my pots, and either replanted with succulents or used the pots for something else. 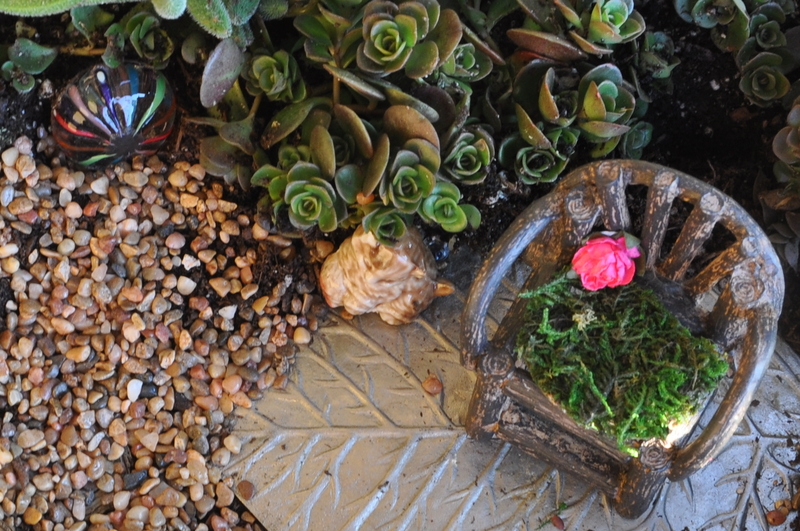 Our deck top fairy garden requires very little water, but seeing those precious drops fall through the holes in the bottom spurred me to action. 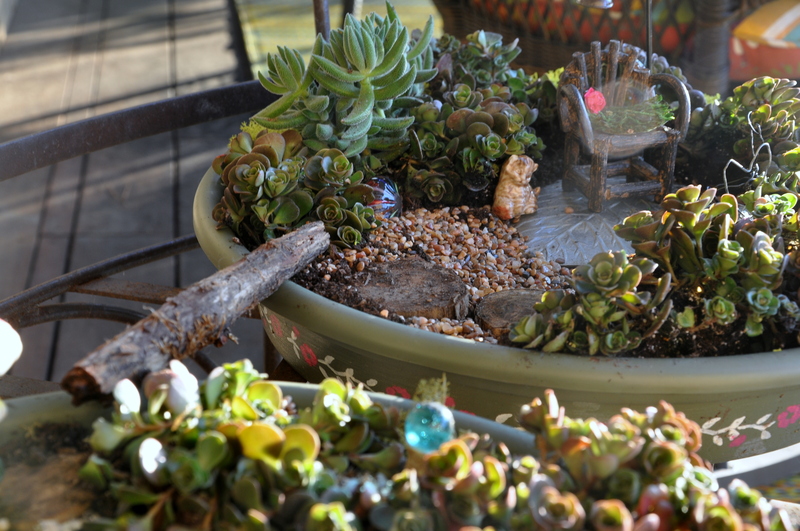 Last week, my miniature fairy garden went native. I meant to save the markers so I could record the name of the plants, but they’ve gone AWOL…or I tossed them with the transplanting newsprint. The good news: the plants sat on my deck for two to three weeks without a drop of water. They passed the test! I’m actually quite smitten with these plants. They fit right in, don’t you think? There’s a story behind the little wooden house (it used to be haunted!). You can read more about that here. After replanting the garden, I spruced up the house with some new drapes. If you look closely, you’ll see that they’re carefully assembled from the finest Washi tape in the land. Nothing but the finest for mystical fairies. The new garden path is also special. I gathered those lovely, flat green stones on the beach in Victoria last summer. Wilma of the Creartfuldodger took Boomdee and me beach-combing along the beautiful island shore. These stones evoke special memories of that day. All the other treasures in the garden are found objects or gifts. The wooden house came from my son’s craft collection. I rescued it from the trash. The reading patio is an upside down candle holder and the charming chair, cat and rose pillow flew here from Canada via Boomdee. Marcia and her girls surprised me with the pink mushroom one cool fall day. 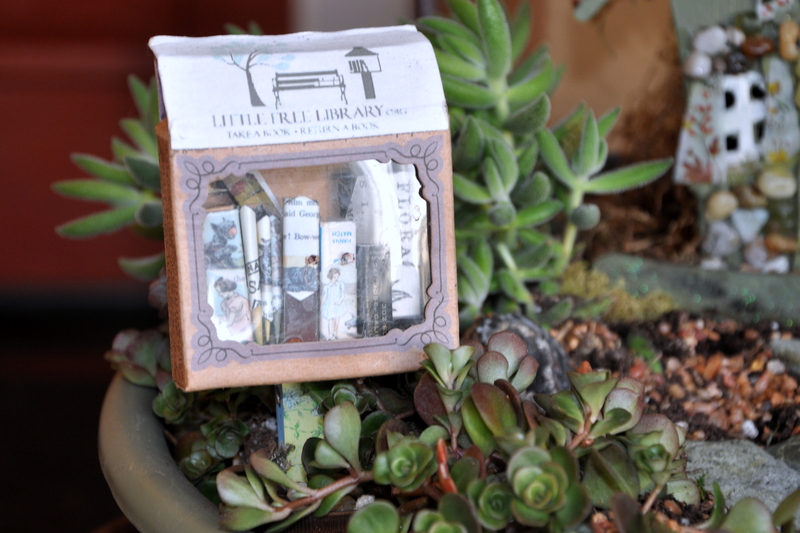 I built the (little) Little Free Library from matchboxes, stickers and an empty box. A clothes pin and a bit of duct tape keep it in place. A friend taught me how to make the heart-shaped chairs from the top of a champagne closure. 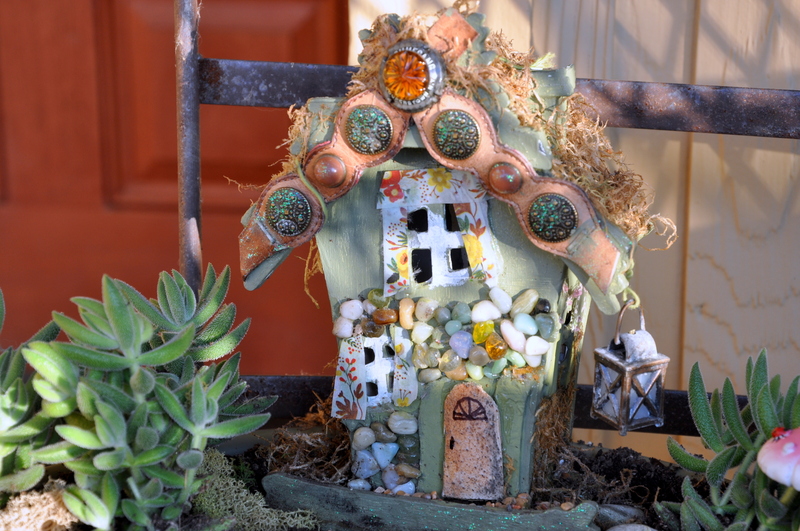 Are you a fairy gardener, too? It’s easy and fun and incredibly relaxing. You can garden anywhere at any time, limited only by your imagination. Jump right in. The [lack of water] is fine! 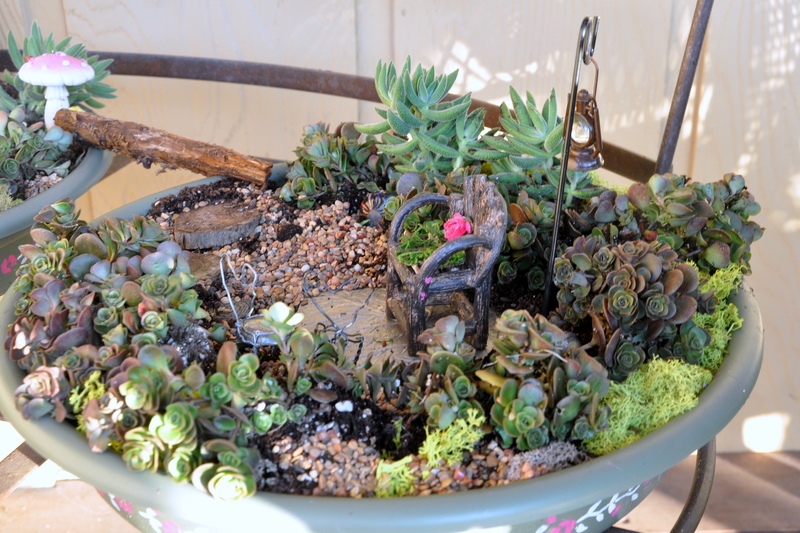 This entry was posted in Gardening and tagged california drought, Fairies, fairy garden, fairy garden furniture, gardening in a drought, miniature garden, native fairy garden, succulents. Bookmark the permalink. Yes! Exactly. I once took several stems of lavender and wove them into a fairy bead. Soft and fragrant. Acorns make wonderful decor as well. After you cut a drying vine, you can use the sticks for fencing. The skies the limit. I’m sure the fairies appreciate the new decor. You are a slave to their whims. I’m anxious to see what else new you have and what you do with it. I too, love succulents. I’ll tell you a little secret. Last week after breakfast out with my daughter, my son and I stopped by the Fabric Depot for a few moments, (ha) and since we were already halfway there, on to the craft warehouse for a stroll. (We shouldn’t be allowed in with our credit cards.) My son, yes, my son, saw a book on Fairy Gardens and bought it. I had nothing to do with it. 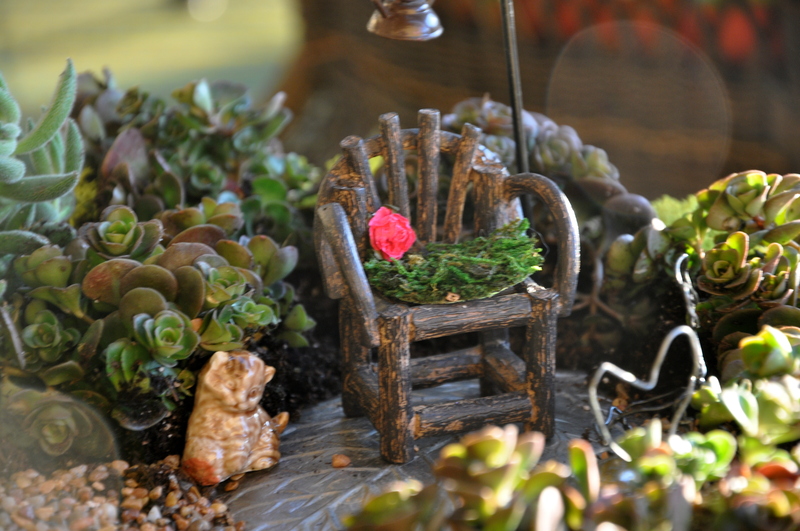 He also loves miniature bonsai trees and orchids. What a guy. Surprises me every day. 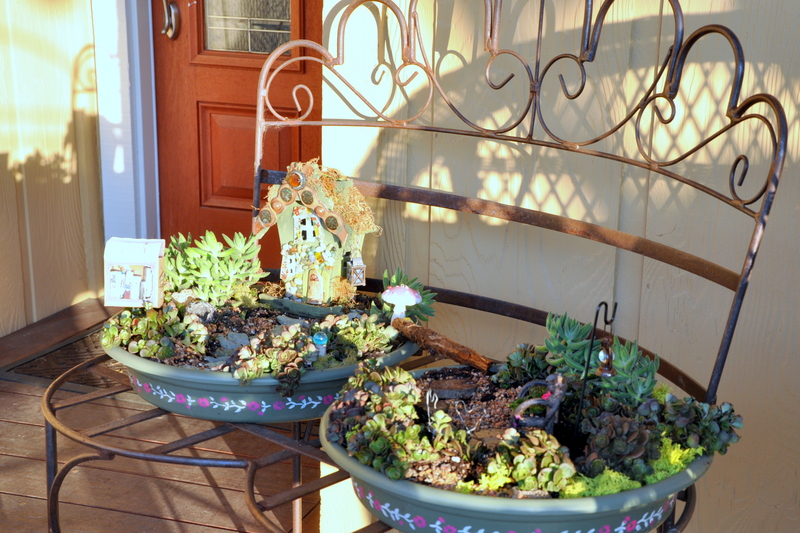 My little fairy garden held it’s own through the winter and is perking up. I put it back outside as soon as we had no freeze. Yours looks so lovely. 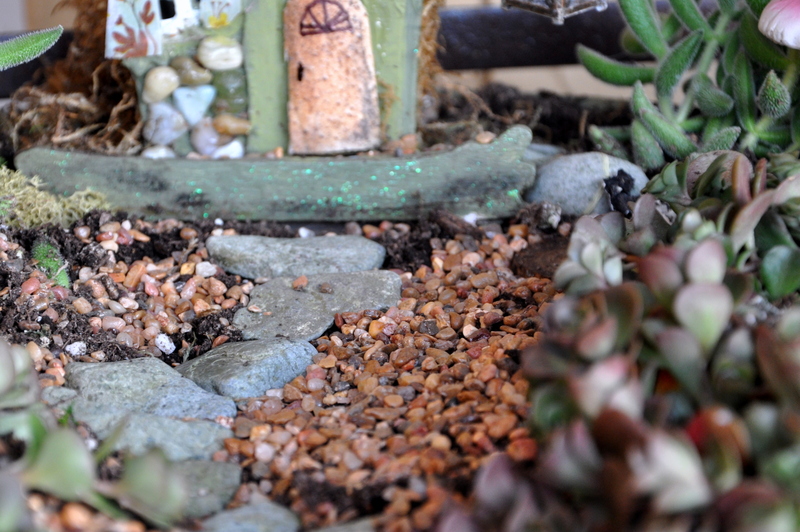 I’m also pleased that your fairy garden survived the winter. I’ll bet it will take off now that it is outside and the weather is reliably warm. How delightful that he continues to surprise you every day. What a great ‘mom’ moment. You never bore me, and I doubt you ever could. I married a Renaissance man. It’s wonderful spending time with people of varying interests. Come to think of it, my dad was that way too. My dad painted, gardened, designed gardens, and dabbled in photography, 8mm movies, stamp and coin collecting. He traveled, volunteered and set a good example for his girls. In my experience, good men are hard to come by. I remained single for many many years before meeting Mike. I tried to make the wrong relationships work, and of course they didn’t. I married Mike just shy of my 36th birthday and feel incredibly lucky that we found each other at a dance I almost didn’t attend. I’m glad you are content. It’s a wonderful way to be in the world. What a fun coincidence, Cyndi. Thanks for your kind words along with hope for life-giving moisture as you so eloquently put it. We’re heading into the dries time of year for our state. Ever drop counts. Thank you, Stacy! I first learned about them when I volunteered at the elementary school garden. In their truest form, you gather rocks, sticks, leaves and other bits of nature and craft a house in a log, tree stump or under a clearing. They’ve caught on in the past few years, and now many nurseries sell tiny furniture to go with them. It’s so much fun. It’s my pleasure! Thanks for teaching me a thing or two about post processing and photography. Isn’t this world nifty? Oh how lovely, I am sure it is very crowded and one big party once the Moon is up! Oh I hope so! Thank you, Johanna. Thank you, Wilma. It was good of you to drive us around that day, sharing your local perspective. I found it so enriching. I had a great time. Oh Pauline, you are so dear. You make me smile, while tickling my funny bone and teaching me a thing or two. 😀 Excellent advice – I probably should give up on the idea of becoming a ballerina too …….. but where are we without our dreams? Oh, we’ll never stop dreaming, Pauline. And think of the dreams that have come true like our visit to D.C. Given a choice between becoming a ballerina and spooning with you in Julia’s basement, I’m happy to let a closet full of tutu’s and toe shoes drift into the ether. This is my first visit to your fairy garden–it’s so special and full of fun! 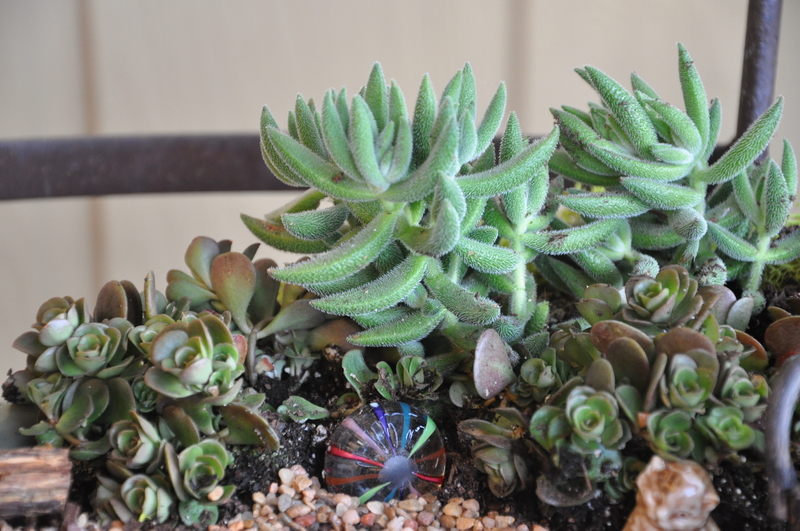 Succulents seem to be your best option and they are so gorgeous and varied. We can’t grow then outdoors here, except for a few sedums, but I love them all! 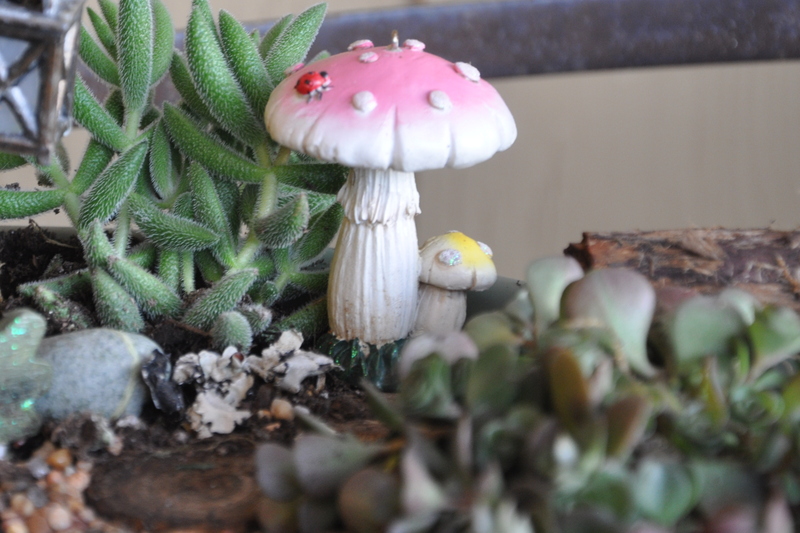 I have so much fun with my fairy gardens. I have a page dedicated to the start of my hobby if you’re interested. I think I might start another one in a corner of the garden, or perhaps under the Little Free Library. You’ve got me thinking now. Wow I have been planning on making a desktop garden for my office using tiny succulents in a large glass jar or shallow vase but seeing these I think I need to rethink. These are amazing. OMgosh, I seemed to have missed your little fairy work of wonder. I’m just bebopping around to try and say hello and see what everyone is up to for a wee bit this morning before I jet off. I”m so glad you found this post. 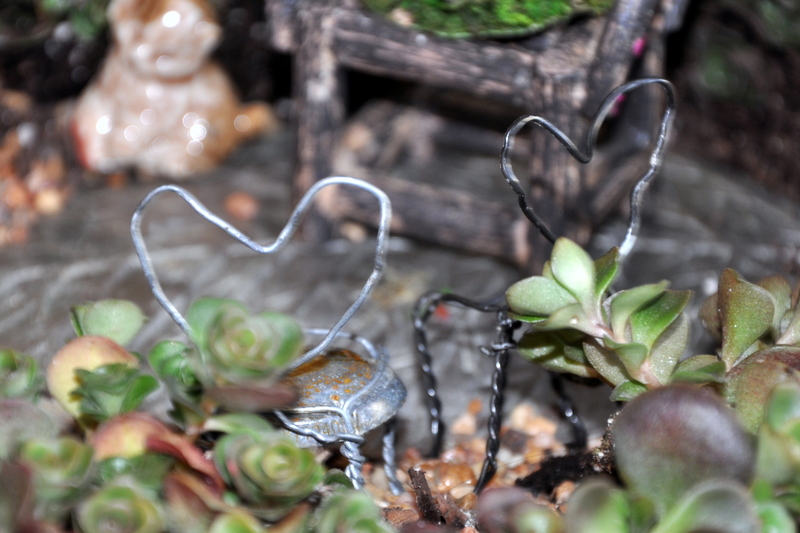 I know you are equally fond of miniature fairy gardens. There are signs of you everywhere. You have an amazing memory. We lost Beijing June 5th. I remember hoping that she could hang in with us one more day so that she didn’t die on C’s birthday. I didn’t place the ceramic cat in the garden at first, but as the loss softens and the joyful memories surface, I look at it as a nice reminder of her and of you and your thoughtfulness. The card you made is equally memorable and beautiful. Now that I’ve added the succulents, I’m really enjoying the look and the guilt-free ease of care. By the way, that little rose on the chair is from you as well. I hope you aren’t too crazy busy with work, house projects and gardening. I’ll bet it feels good though to have emptied your locker and planted a summer garden. Like me, I know you enjoy decorating your porch and deck, too. It’ so much fun, isn’t it?